This past week, I spent some time at my dear Mom-in-love's home. After the passing of her husband this summer, there are many things to take care of. While we were working on a project, she came across her wedding dress. She wore the dress over 50 years ago, getting married when she was eighteen. She was unsure of what to do with the dress and I told her I would take it home and have it preserved, but for a little while I will leave it on my dress form to look at it. 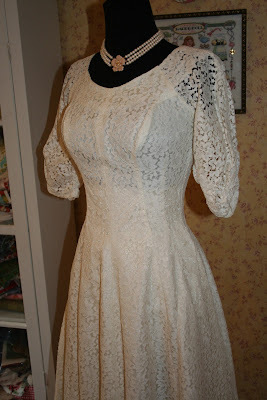 I love the simplicity of this lace dress. My what a tiny waist it has! It's so good to have our memories, and in this case a tangible one to cherish. Have a wonderful Saturday! 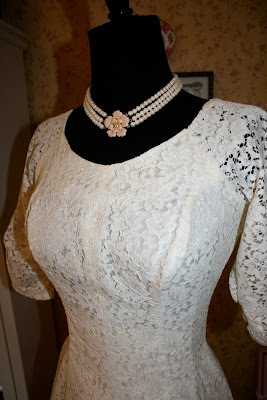 Just discovered your blog..I love that wedding dress it's gorgeous...what a special keepsake. The styles back then were so feminine, we are starting to see a bit of a return of that. What a beautiful dress - so simple but elegant. Give me a dress like this anyday instead of some of these over-the-top thousands of dollars dresses girls think they need now. oh such sweet memories...that is an amazing dress. Now that's a wedding dress! Much lovelier than the 80's Madonna style dresses that go for 10 grand today. It's very nice of you to preserve it. 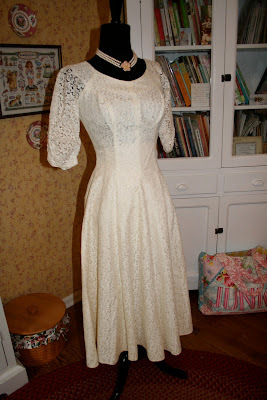 I also just discovered your blog and what a treasure that dress is..thanks for sharing! How special for your MIL to share her treasure with you and a treaure you are for having it preserved. But it does look so pretty on your dress form for now.